What can you get for $149.7 million? How about a nice Jackson Pollock masterpiece? Too rich for you? OK, how about Art, from ADS Software?If nothing else, the $1 app will run you hundreds of millions less than that Pollock painting, and you might learn a thing or two as part of the bargain. Yes, But Is It Art? 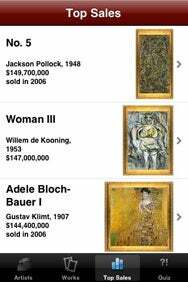 : Browse through more than 400 works in Art by artist, works, and—in this view—top selling paintings. Art includes around 400 works to investigate, enough to keep most art students busy for a few days. Each image and artist is accompanied by a link to a Wikipedia entry, so you should be able to find out why van Gogh lost that ear. You have several options with the artwork presented. You can browse Artists, Works and Top Sales, and also play a quiz game. Searches are possible, but only of artwork, not of artists. Images may be rotated horizontally, providing a better viewing experience for images so oriented. Notably, pictures can be saved to the phone, allowing you to store them in your photo library, use them as wallpaper, or export them to your computer. The images look good, and can be zoomed and moved, but the resolution is not really high enough for anything bigger than an iPhone. The included quiz game is simple enough. Art shows you an image, title and perhaps the year; you have to pick the right artist from among four choices. It can be tougher than it sounds, but let’s just say I was pleasantly surprised how much of my college art history class I remembered. Now, I’m not exactly an expert, but I know there have been more than 400 works of art produced in the history of the world; and this app seems to think a hefty chunk of them were produced in Russia. An exhaustive catalogue it is not, but Art is a novel application for the student, beginner, or hobbyist. Art is compatible with any iPhone and iPod touch running the iPhone 2.x update.